The geese are flying north to the Arctic, the kids are back at school and now that the summer holidays are over the French are out on strike again. It is harvest time and the Formula 1 team owners have parked their yachts in Toytown, Sardinia, and are back to the business of not agreeing with one another. Formula 1 may think it lives a jetset existence but the truth is that we are just like medieval peasants with paddock passes. Life comes in cycles. And so, as happens every second weekend in September, the Formula 1 circus arrives at the Autodromo Nazionale at Monza. The girls and the food are still gorgeous and the waiters in the local pizzeria remain as indolent as ever. Like the summer evenings, the Ferrari lap times are miraculously getting shorter. The team has somehow gained a magical half a second (as they do every year on the run up to Monza) and the World Championship, which looked like being a foregone conclusion for McLaren, is suddenly on again. Everything is set up for a grandstand finish. At the autodromo little has changed. The old banking and the magic is still there. This is what Grand Prix racing is all about. This year there was a bit of grumbling about the reprofiled first chicane but racing drivers complain about anything new and say that it could be dangerous. They soon get used to it. The intention of redesigning the chicane was to ensure that when the drivers arrive at 200mph if they have a problem they will not go into a barrier. They may end up going across the new chicane and hitting another car but in general this is better than hitting a solid object and as Monza cannot cut down any more trees this was the best compromise. Once the whingeing about the first chicane was out of the way, it was time for action and soon the two Ferraris were first and second with the McLarens trying to catch up. The red cars were fastest in every session and when it came to qualifying, after the two Williams-BMWs had a brief moment of glory, it was a straight fight between McLaren and Ferrari. David Coulthard set the ball rolling but almost immediately he was beaten by Michael Schumacher - and by a good four-tenths of a second. Pole did not then change until Michael knocked himself off the top with a lap which shaved another two-tenths from his time. The only disturbance after that was when Rubens Barrichello grabbed the number one slot for a few short minutes before Michael put the question beyond doubt by a tenth. In the final moments of the session the two McLarens had another try. Coulthard was held up by Heinz-Harald Frentzen (the two had a similar incident at Spa one may recall) and so his bolt was shot. Hakkinen tried his best but he was two-tenths slower than Schumacher and third on the grid. "I wasn't completely happy with the handling of the car," he reported, "and we experienced a few technical problems, which disturbed our concentration." Schumacher was, of course, delighted. "It's good to be back on the right road," said Michael. "The car felt quick." Barrichello was also very pleased to be competitive again after a couple of disappointing races. "I think I could have gone a bit quicker," he said "but at the end I had some problems with traffic, but I am happy with my car." And so while all was rosy in the red Ferrari garden things were not quite as jolly at McLaren. Hakkinen's third was a disappointment but the fact that Coulthard was fifth was verging on a disaster. "They are not ideal grid positions," team boss Ron Dennis said, "but we should be competitive in the race." "We have won from this grid position before," commented Mercedes-Benz's Norbert Haug. The race looked likely to be settled by the ability of the cars to survive on their tires. The McLarens have been better on tire wear all year but with Barrichello alongside him Schumacher had the opportunity to get away while Barrichello kept the McLarens bottled up behind him. But that would depend on the start. The interloper in amongst the big four on this occasion was Jacques Villeneuve in the BAR-Honda. Monza is a track where engine power is a useful thing to have and the new Honda engine clearly has a bit of grunt. This is what should have been happening for most of the season," said Villeneuve. "We haven't been competitive enough this year." Things were not so good for Ricardo Zonta who found himself 17th on the grid because of a gearbox problem which stopped him out on the race track. He switched to the spare car which was set up for Villeneuve and had to drive without being able to feel the pedals as he likes. "I attacked as much as I could," he said. The first of the Jordans, driven by Jarno Trulli, was sixth on the grid, with Heinz-Harald Frentzen in eighth place. This was not a bad job in the circumstances as Trulli had a mysterious problem that had to be found by his mechanics (it turned out to be a hydraulic pump glitch) and Frentzen made life difficult for himself by crashing in the Parabolica. Frentzen complained about traffic which was a bit rich given that he blocked Coulthard in a fairly unsubtle fashion. Between the two yellow cars was Ralf Schumacher's Williams-BMW. The German was locking his brakes at every available corner and one could not help but wonder how this would leave him in the race. Jenson Button was much smoother and neater than his team mate but he was only 12th on the grid and very disappointed. Ninth on the grid was Giancarlo Fisichella. This was a good effort given that Giancarlo's confidence has been somewhat shaken in recent weeks by large accidents in his Benetton. "My target was to be eighth," said Fisichella, "so we lost just one position." Alas, Alex Wurz's run of miserable results continued with 13th place on the grid. "I am very upset," he said. "Maybe more than I have ever been in my Formula 1 career." He had a fuel system problem in the morning and so had to run the spare car in qualifying and it did not behave as Alexander would have liked it to do. Tenth and 11th on the grid were the two Arrows of Pedro de la Rosa and Jos Verstappen, much more competitive after the mysterious lack of performance in Belgium recently. This was a commendable effort given that Jos had troubles with his car and had to take the spare and then switch back to his race car. The two were separated by a smidgen. The cars were fastest of all through the speed traps which would seem to suggest that the aerodynamic efficiency of the car is very good. Small wonder that Arrows aerodynamicist Egbahl Hamidy has signed a deal to join Jordan GP when he is available to do so. Down in 14th place was Eddie Irvine in the Jaguar and his team mate Johnny Herbert was 18th, a tenth of a second slower. The car is not that good, as the speed trap figures showed, but this was still a disappointing performance. Eddie can console himself that he is the best paid driver in the midfield but Herbert has little consolation. Sauber had another dull qualifying given that the cars are powered along by Ferrari V10 engines with Mika Salo just beating Pedro Diniz. Yawn. The story of Prost was as it has been in recent races: barely worthy of mention. Jean Alesi was 19th and Nick Heidfeld was 20th. And Marc Gene and Gaston Mazzacane in their Minardis were at the back as always. It would be front page news if they were not. AT the start everyone got away without trouble except Jean Alesi, who was left sitting on the grid. On the run down to the first corner, Villeneuve was the fastest but he was bottled up behind Barrichello. Hakkinen had more momentum and was trying to find a way to pass Michael Schumacher. Michael moved right to block the challenge. He then moved to the left. This was clearly two different manoeuvres which is not supposed to be allowed but as Michael was moving to take his line into the corner one must suppose that this was not a problem. "I was behind Michael and thinking about overtaking him on the inside," said Mika later. "He moved to the inside, so I moved back, outside the normal line. He moved too, but... Anyway, that's the way it went. I ended up second at the first corner." There had been much talk over the days leading up to the race that the first chicane would be a place for an accident to happen. As it happens, this turned out to be the case but it was not a serious crash. Eddie Irvine and Mika Salo tangled and together bumped into Pedro Diniz. He went into a polystyrene block and damaged the nose of his car, while Salo suffered a left rear puncture and Irvine a broken front suspension. The two Saubers would later pit and rejoin but Irvine and his Jaguar were out. At the second chicane there was a very serious accident. Schumacher, Hakkinen and Coulthard arrived in the corner without drama but behind them Trulli and Barrichello were side-by-side and Frentzen was behind them, looking for a way around both of them. Everyone braked very late but Frentzen could not stop in time and at high speed smashed into the back of Barrichello and Trulli. "I was trying to overtake Barrichello," said Heinz-Harald later. "He changed line and braked unexpectedly early." The three cars, showering wheels everywhere, smashed into Coulthard as he turned into the corner. David was just plain unlucky. The accident effectively ended his World Championship hopes. Barrichello was upset and angry with Frentzen. Trulli was livid. Jacques Villeneuve and Ralf Schumacher were able to get through the carnage. "I just saw a lot of dust and car parts flying around," Ralf reported. "Jacques and I managed somehow to get around it, but it looked really terrible." Behind them Fisichella, Button and Wurz all scrambled through the wreckage but Herbert and Zonta arrived side-by-side as they braked heavily. "I could see a wheel about 100ft up in the air," reported Herbert later. Behind them de la Rosa arrived at high speed and ran into the back of Herbert's Jaguar. "I just couldn't slow down my car enough," he explained. "I was launched into the air and then just barrel-rolled until the car stopped. I wouldn't say I was unlucky because I am lucky to be here." The Arrows ended its journey upside-down in the sand trap with de la Rosa underneath. He burrowed his way out and was unhurt apart from a few bruises. Johnny drove the car back to the pits on three wheels to retire. Zonta too was involved and suffered a puncture. What was not immediately obvious amongst all the carnage was that Trulli's left rear tire had been torn from his car with such violence that it was hurled to the outside of the track at head-height. Eyewitnesses report that it hit Paolo Gislimberti, a fire marshal. The details of the accident will, no doubt, be fully established by official investigators and there will be decisions about who is to blame and whether or not any legal action should be taken given Italy's peculiar legislation. Formula 1 has lived through all this once in recent years, after Imola in 1994, and there is no doubt that the consequences of the accident will probably be in the news for many months to come. It was obvious that with the medical cars and marshals at the scene there was going to be a long period behind the Safety Car and so those who had to pit for repairs did not lose too much ground as they were able to catch up to the queue of cars after their stops. Salo's car was handling so badly after his stop that he stopped again, had a new engine cover and sidepods fitted and was still able to rejoin at the back of the 14-car queue. The field was further reduced just before the race restarted at the start of lap 12 when there was nearly another major accident on the back straight. Having sat behind the Safety Car for so long, the tires and brakes had lost all their temperature. Michael Schumacher decided that he needed to warm things up before the restart. "After the Safety Car switches off the lights, the leader dictates the gap of the Safety Car," he said. "I was accelerating/braking, accelerating/braking, to warm up my brakes. I think I made a mistake the way I did it, because when I started braking again all the cars behind started braking, but probably saw it a little bit too late. I'm sorry for whoever suffered from that. I thought that everybody knew what I was going to do." Clearly they did not. Hakkinen braked. Villeneuve braked. Ralf Schumacher and Fisichella swerved to the right to avoid hitting the BAR and Button had nowhere to go but off on the left. He hit the barriers. 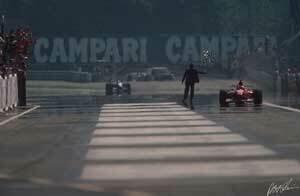 He rejoined but at the Parabolica the car did not turn and off he went. Button was furious afterwards and blamed the leader for his accident. "I had nowhere to go," he said. "Everyone was spread across the circuit and I finished up on the grass trying to avoid Villeneuve's car. I am very lucky that I did not get hurt. I don't know what he was doing." So it was down to the lucky 13 survivors. Michael Schumacher tried to build up an advantage. He could only chip a tenth here and a tenth there but he was still able to build a gap of nine seconds over Hakkinen by lap 30. Mika explained that he was not happy with the handling of his car. Michael stopped for fuel and tires on lap 39 and for a few short laps Hakkinen led the race, but when he stopped he had not done enough to get the lead. During the pit stop McLaren made some very rapid changes to the car and when he rejoined it was much better. But it was not enough. "The gap to Michael was too much," Hakkinen admitted. "It was impossible to catch him." Mika did a good job but it was clear that Schumacher had the win in his pocket. After the race he was delighted. On the podium he was dancing about as so often he does. It was the usual Schumacher behavior. "I am just happy," he said. And then it was pointed out that with the win Schumacher had equalled Ayrton Senna's record for victories and a most extraordinary thing happened. He broke down and wept uncontrollably. And it was not from joy. It was such that even Hakkinen felt the need to console him. Whatever it was that upset Michael at his moment of victory is really no-one's business but his own. It was just strange for a man who has never shown a trace of such emotion in the past. Behind Michael and Mika, third place went to Ralf Schumacher. Fourth after the first lap he moved to third when Villeneuve retired on lap 15. He was then pushed back to fifth by the charging Verstappen and Zonta, having been told by his pit that both men were running on light tanks. Zonta was but Verstappen was on a one-stop strategy. Fortunately for Ralf the Arrows stopped early and so those who pitted later were able to win back lost time. Ralf was third when he pitted and third when he rejoined. Verstappen ended up fourth. That position would probably have gone to Fisichella had he not run into clutch trouble at his pit stop, when he was running in fourth place. The car stalled and eventually had to be push-started. By the time that had been done Fisichella was down in 11th position. Wurz salvaged some of Benetton's pride with a fifth place finish, his best result for a long time. Zonta's idea of running a fast two-stop race was ruined by the accident, which caused him to pit. Fortunately he did not lose too much time because of the Safety Car although this did not really help his cause as he needed to be lapping quickly in the early laps. After the Safety Car he drove from 13th place to third. When he pitted on lap 23 he dropped back to 11th and then started to climb again before getting stuck behind Wurz. As a result his second stop was made earlier than planned and so he ended sixth. The two Saubers finished seventh and eighth which given the fact that both Salo and Diniz had been in the pits was a pretty good effort. The Minardis were ninth and 10th which team boss Gabriele Rumi described as being a "respectable" performance. Jean Alesi was the last runner still going back in 12th, two laps down. His race had been compromised at the start when his car failed to fire up. Heidfeld did slightly better. He was running ninth when his engine failed after 15 laps. We will have to see what happens as a result of the accident but let us hope that the sport will learn from its mistakes in the months ahead.